Glass ionomer cements (GIC) were first introduced to dentistry in the late 1960s and since have proven to be useful in various areas of dental science, particularly restorative dentistry. As an aqueous polyelectrolyte system, GICs are known for their relative ease of use, chemical bond to the tooth, fluoride release and recharge, low coefficient of thermal expansion, and acceptable esthetic quality. However, clinical usage of GICs is still limited due to their relatively inferior mechanical properties and sensitivity to initial desiccation and moisture. Years of extensive research on enhancing the chemistry of the basic glasses have yielded improved formulations with enhanced mechanical properties and reduced moisture sensitivity. A comprehensive review of the available literature has revealed that not all modifications in glass powder have resulted in the desirable strengthening of GICs. There is a shift of focus toward studies on nanoscale particles and bioactive glass. Recent research has proven that incorporation of nanoceramics such as hydroxyapatite (HA), fluorapatite, silica, and zirconia (ZrO2) have resulted in improved mechanical properties of GICs due to their ability to release fluoride, high surface area, and better particle size distribution. More work should thus, be undertaken to optimize techniques for enhancing the physicomechanical properties of GICs by incorporation of nanophases of ZrO2, HA, and metallic nanofillers. Glass ionomer cements (GICs) were first introduced to dentistry in the late 1960s and since have proven to be useful in various areas of dental science, particularly restorative dentistry. As an aqueous polyelectrolyte system, GICs are known for their relative ease of use, chemical bond to the tooth substrate, fluoride ion release and recharge, low coefficient of thermal expansion, and acceptable esthetic quality. They are also found to be biocompatible with pulp tissues and primary cultures of bone cells. However, clinical usage of GICs is still limited due to their relatively inferior mechanical properties and sensitivity to initial desiccation and moisture. To improve the weaknesses and limitations, many modifications in the composition of GICs have been attempted, especially in the glass powder. Metal powders, reactive glass fibers, and other nonreactive fillers have been evaluated as potential reinforcement phases to improve the mechanical properties of GICs without compromising their adhesive and fluoride release properties.,,, However, the initial modifications lacked in the bonding between the reinforcing filler and the GIC matrix. Recently, there have been significant changes and modifications in the formulations of the acidic and basic parts of the GICs, leading to enhanced mechanical and handling properties of the material. It is hypothesized that by increasing the degree of polysalt bridge formations and cross-linking within the matrix of the set cement, the mechanical properties of GICs may be enhanced, which in turn, would make them a desirable choice for posterior restorations. Based on previous studies,,, and the current level of intensive research on the properties of the GICs, there is a strong hope to improve the clinically related properties of these materials. An electronic search of publications from the year 1970 to 2018 was made using the electronic databases-ScienceDirect® PubMed® and EBSCOhost through our institutional membership access. The inclusion criterion was abstract or full-text articles, original research, reviews or systematic reviews. The keywords used for the search were selected listing the following five combinations: (1) GICs, (2) glass powder, (3) mechanical properties, (4) modifications, and (5) nanoceramics. Nowadays, researchers are shifting focus on the bioactivation of GICs with the aim to improve their mechanical properties. Since GIC can bind chemically with enamel, dentin, and bone by the interaction of the aqueous polyacid with the apatite of these hard tissues, GIC can be considered bioactive. The bioactive glass was developed by Hench in 1969, and formed a stable bond or interface with tissues by the formation of an apatite layer. The first commercial bioactive glass consisted of 46.1 mol% silica (SiO2), 24.4 mol% Na2O, 2.6 mol% P2O5, and 26.9 mol% CaO and was called 45S5 or Bioglass®. Depending on the composition of BAG, the hybrid GICs have been shown to display antimicrobial properties. A study has been done to determine compressive strength, Young's modulus of elasticity, and Vickers hardness of BAG particles incorporated in GICs. Experimental GIC-BAG materials were made by mixing 10 or 30 wt% of BAG particles with conventional cure (cGIC) and resin-modified GIC (RMGIC) powders. The results showed that the compressive strength of the samples decreased with the increase of BAG content. The compressive strength of RMGIC increased during the immersion but remained at a lower level than that of the cGIC. The cGIC-BAG materials had on average 55% higher surface microhardness than the RMGIC-BAG. The amount of F release was significantly higher on all RMGIC-BAG, being the highest on RMGIC-BAG with 30 wt% of BAG after 180 days of immersion. In another study, two types of BAG (45S5F and CF9) were combined with GICs to evaluate the physicochemical properties and biocompatibility of the BAG-GIC combinations along with the effect of the addition of Al3+ to the BAG and the use of smaller BAG particles. The GIC-BAG was synthesized by the melt method followed by evaluation of setting time, compressive strength, bioactivity, and biocompatibility. The researchers concluded that the addition of BAG improves the bioactivity of the GIC, which was evident by the formation of an apatite layer, especially in CF9-containing GICs. More BAG leads to more bioactivity but decreased the compressive strength. The addition of Al3+ to the BAG composition improved the compressive strength but decreased the bioactivity. Bioactive glasses with smaller particle sizes had no effect on bioactivity and decreased the strength. The CF9 BAG-GIC combinations containing a maximum of 10 mol% Al3+ gives the most promising result when added in ≤20 wt% to a GIC. Several studies have focused on the effect of glass fiber incorporation on the mechanical properties of GICs specifically fracture toughness and strength.,, Lohbauer et al. evaluated the fracture toughness and total energy release of a fiber reinforced glass ionomer for dental applications containing 20 vol % short fibers (430 mm). An increase of fracture toughness of 140% and total energy release rate of 440% was achieved compared to the unreinforced GIC. In a more recent study, Garoushi et al. investigated the reinforcing effect of hollow and solid discontinuous glass fiber fillers with two different loading fractions on fracture toughness, flexural strength, flexural modulus, compressive strength, and diametral tensile strength of conventional and RMGICs. The results demonstrated an increase in fracture toughness (280% and 200%) and flexural strength (170% and 140%) of hollow discontinuous glass fiber reinforced (10 wt%) conventional and RMGICs, respectively, compared to unreinforced materials with the exception of compressive strength which did not show any significant difference. In a recent study, nHA and fluorapatite (FA) were synthesized using an ethanol-based sol–gel technique and incorporated the synthesized nanoparticles into commercial GIC powder (Fuji II GC). Compressive, diametral tensile, and biaxial flexural strengths of the modified GIC were evaluated. The results showed that the nHA/FA added cements exhibited higher compressive strength (177–179 MPa), higher diametral tensile strength (19–20 MPa) and higher biaxial flexural strength (26–28 MPa) as compared to the control. It was concluded that GICs containing nanobioceramics are promising restorative dental materials with both improved mechanical properties and bond strength to the dentin. In addition, decreasing the particle size of apatite from micrometer to nanometer scale increases their surface area remarkably, and infiltration of the crystals into demineralized dentine as well as enamel may enhance bonding at the tooth-ionomer interface. 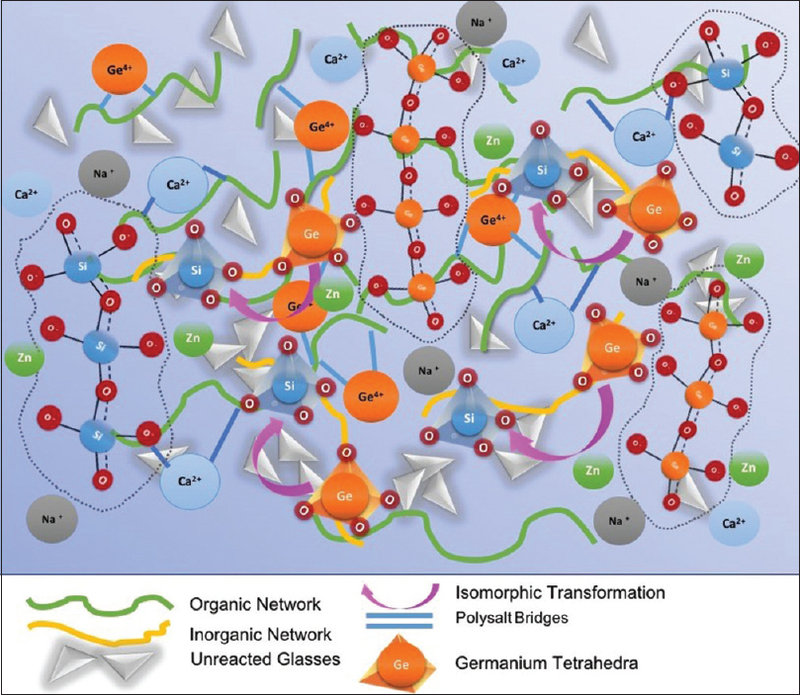 Several researchers added SiO2 in GIC to improve their mechanical properties., Attempts have been made to use SiO2 based reinforcing agents in the skeletal structure of the GIC to increase the number of polysalt bridges in the glass matrix and to improve its transparency. Ahmad Shiekh et al. synthesized a nano-HA-SiO2 (nano-HA-SiO2) powder using a sol–gel technique. In continuation of the same research, the authors evaluated the Vickers microhardness of nano-HA-SiO2 GIC containing different wt% of SiO2 (11%–35%). Thus, the samples were then labeled as HA-11SiO2, HA-21SiO2, and HA-35SiO2. The results demonstrated that Vickers hardness of 5%HA-35SiO2-GIC was the highest (70.8HV) when compared to HA-21SiO2–GIC and HA-11SiO2-GIC, giving <73% improvement. In a more recent research, Moheet et al. evaluated the mechanical properties of the nano-HA-SiO2 GIC composite along with various characterization studies (66). Hardness, compressive strength and flexural strength of nano-HA-35SiO2-GIC were found to be statistically higher than that of nano-HA–21SiO2-GIC and nano-HA-11SiO2-GIC. Therefore, it was concluded that nano-HA-35SiO2-GIC can be suggested as a potential dental restorative material. Zirconium and its oxide, due to their good dimensional stability and toughness (on the same order as stainless-steel alloys), have been used widely for the toughening and strengthening of brittle HA bioglasses in biomedical applications., In a recent study, a composite HA, alumina/zirconia (ZrO2) nanocomposite (HANBG), was synthesized using one-pot synthesis and was compared with the cGIC for bio-activity, anti-bacterial, and mechanical properties. The prepared HANBG composite showed an increase in hardness (1.13 GPa) and Young's modulus (22.89 GPa) and an in vitro bioactivity was confirmed with an increase in HA layer formation. In another latest research experiment, Rahman et al. prepared a nano-ZrO2-SiO2-HA (nanoZr-Si-HA) powder by sol–gel synthesis which was then mixed at varying w/w percentages (1% to 20%) with commercial GIC powder (Fuji IX GP) under a controlled grinding process (73). The nanopowder was characterized, and Vickers hardness was evaluated. In general, the hardness increased with an increase in the nano-zirconia content up to 5% and then decreased on further addition. The highest hardness mean values were with the addition of 5% for nano15Zr-Si-HA (~70.66 HV) and nano25Zr-Si-HA (~79.38 HV). The presence of aluminum in the glass phase of all commercially available GICs has restricted their widespread use in orthopedics, as aluminum is believed to cause defective bone mineralization, inhibiting the formation of a stable bond between GIC and bone. However, the aluminum ion plays an integral role in the setting process of a GIC, and its absence can hinder cement formation. Fortunately, zinc oxide (ZnO) can act as both a network modifying oxide and an intermediate oxide in a similar fashion to alumina. In an earlier study, Zn silicate GIC based on two different glasses containing lower and higher concentration of Ca, respectively, were evaluated for mechanical and biocompatible properties with the ultimate objective of developing a bone cement. The flexural test results were comparable to conventional GIC but set in 1–2 min resulting in poor handling characteristics. 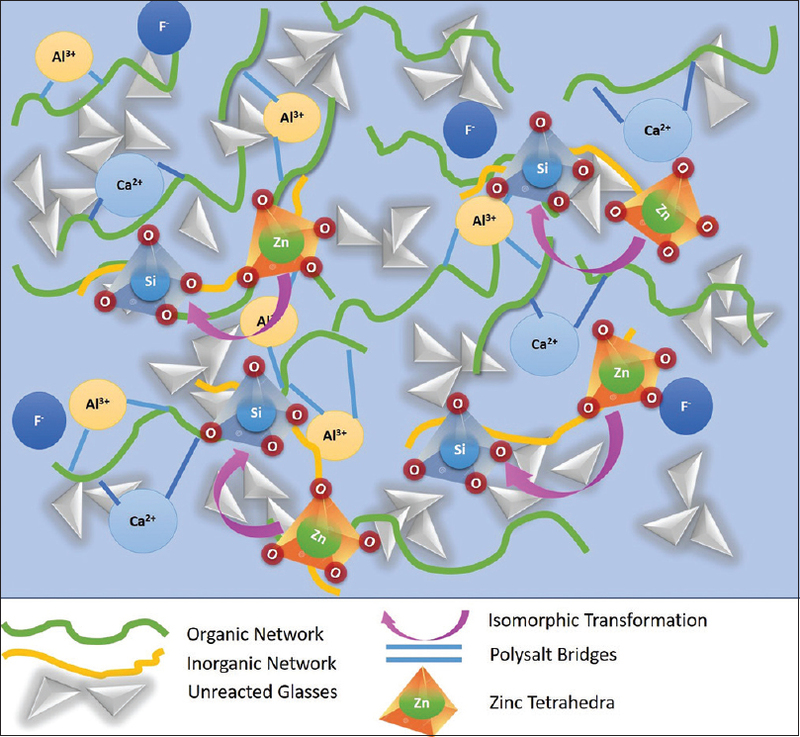 In glass containing a lower concentration of Ca, Ca2+ ions facilitated the isomorphic replacement of SiO2 tetrahedra in the glass structure with ZnO4 tetrahedra, the remaining Zn acts as a network modifier and subsequently increases the susceptibility of the glass to attack making it more bioactive [Figure 1]. Niobium pentoxide (Nb2O5) is a metal oxide generally presenting a monoclinic form known to enhance the mechanical properties when incorporated in metal alloys and exhibits biocompatibility and bioactivity. Bertolini et al. prepared a glass system based on the 4.5SiO2 –3Al2O3 –Nb2O5 −2CaO composition aiming to use these as GIC network formers. The results showed that the setting time of the cement pastes increased with increasing Nb content of the GIC. In contrast, the mechanical properties were adversely affected. Another more recent research revisited the effect of Nb2O5 on the physical and chemical properties of a new GIC formulation. A high purity Nb2O5 (particle size 38.16 μm) was added to the GIC at varying w/w percentages (5%–10%) and hand mixed. The authors concluded that the addition of 5 wt% Nb2O5 did not affect the physical and chemical properties and improved the radiopacity of the GIC. Therefore, this new GIC was suitable for further testing of biomimetic remineralization potential. In a study, the effects of the addition of either Ytterbium fluoride (YbF3) or barium sulfate (BaSO4) on the working time, setting time, surface hardness, and compressive strength of a conventional GIC was evaluated. YbF3 and BaSO4 nanoparticles were incorporated separately into the glass powder [Figure 3] at different w/w percentages (1%–25%) and a reduction in working and initial setting times were observed. Compressive strength was decreased with the addition of either YbF3 or BaSO4, while surface hardness was slightly higher at 1%–2% nanoparticles addition and then decreased with increasing concentrations. The effect was more pronounced for BaSO4 addition, where even 1% inclusion in the powder resulted in a drop of more than 10% in strength, from 160 to 142 MPa. While YbF3 decreased the strength of the cement, cements containing 25% YbF3 were still sufficiently strong to pass the ISO standard for restorative materials. The authors concluded that the nanoparticles modified the setting characteristics, strength and surface hardness of GIC, and may be useful for refining the handling characteristics of these materials. Casein phosphopeptide-amorphous calcium phosphate (CPP-ACP) nanocomplexes have been shown to prevent demineralization and promote remineralization of enamel. Zalizniak et al. evaluated the effect of a variety of acidic and neutral conditions on surface hardness and mass and ion release of a CPP–ACP incorporated GIC. They found that the incorporation of 3% (w/w) CPP–ACP into GIC enhanced calcium and phosphate ion release, without hindering fluoride ion release and no adverse surface hardness or mass change was observed. Therefore, they suggested that this new material holds promise to inhibit demineralization associated with caries and erosion. After the success of HA, biomaterial research was directed toward more bioactive materials. Forsterite is an important material in the magnesia–SiO2 system, where compared to HA, forsterite demonstrated a significant improvement in the fracture toughness and showed significant osteoblast adhesion in vitro. In 2014, Sayyedan et al. conducted a study to assess the effect of forsterite nanoparticles on the mechanical properties (compressive, flexural, and diametral tensile strength) of GIC. The forsterite nanoparticles were synthesized by a sol–gel process and added to GIC at 1–4 wt%. The results showed that the addition of 1 wt% forsterite nanoparticles increased all the three mechanical properties of GIC. The authors also observed that fluoride release from the hybrid material was slightly less than conventional GIC. Hence, they recommended that forsterite incorporated GIC may be used as a dental restorative material and bone cement. In certain glasses, some or all of the Ca is replaced by strontium (Sr), to render the cement radiopaque as an important requirement in the ISO standards. However, the effect of substituting Ca with Sr ions on setting process has not been fully investigated. A recent investigation evaluated the mechanical properties of a novel Al-free Sr-SiO2 glasses prepared by substituting magnesium (Mg) partially (x) with SrO based on SiO2-P2O5-CaO-ZnO-MgO (1-X)-SrOX-CaF2. All mechanical properties of the GICs with SrO substitution at X = 0.25 were significantly increased, then gradually decreased with further increase of the Sr. In recent years, Sr has been incorporated into dental biomaterials to reduce microbial contamination due to their antimicrobial activity. Brauer et al. tested the influence of Sr on the antimicrobial activity of a BAG bone cement in vitro, and the results show that bactericidal action of the cement can be increased through BAG-Sr substitution. Montmorillonite clay (MMT) is a tri-layered smectite clay consisting of stacked platelets constructed of an alumina layer sandwiched between two SiO2 layers. This clay when treated by an organic surfactants (intercalants), such as 12-amino-dodecanoic acid results in an organically modified clay called 12-amino-dodecanoic acid treated MMT (ADA-MMT) clay. Dowling et al. in their research, combined an inorganic calcium MMT (Ca-MMT) and an organic ADA-MMT clay with a conventional GIC at 0.5–2.5 wt%. The compressive strength evaluation demonstrated that addition of up to 1.0 wt% ADA-MMT resulted in a significant increase in the mean compressive fracture strength (133 MPa). Conversely, Ca-MMT clay resulted in a significant reduction in mean strength. The authors postulated that widened interlayer spacing between the clay platelets of ADA-MMT may provide an opportunity for the polyacrylic acid chains of the GIC matrix to diffuse into the MMT galleries, thereby, increasing the compressive strength of the ADA-MMT reinforced GIC. Paiva et al. developed a unique polyacid formulations by a one-step photoreduction of NanoAg in a commercial GIC with the intent of imparting antibacterial activity and enhancing mechanical properties. The resulting formulations contained small and well dispersed spherical nanoparticles (<6 nm) of NanoAg. The antibacterial activity of these cements was assessed by Ag+ diffusion tests on nutritive agar plates and by MTT assay. The higher concentration of Ag (0.50% by mass) in the matrix of NanoAg-GIC improved handling and increased compressive strength by 32% of NanoAg-GIC along with significant inhibition of microbial activity (P < 0.05). In a more recent work, Silva et al. evaluated the addition of CmF/cellulose nanocrystals (CNC) to GICs to improve their mechanical properties. Different wt% of previously prepared CmF and CNC was added to the GIC powder while it was being manipulated. Specimens were fabricated and submitted to mechanical testing. They concluded that the addition of only small concentrations of CNC in the GIC led to significant improvements in all the mechanical properties as follows: compressive strength, diametral tensile strength, and elastic modulus increased by 110%, 53%, and 161%, respectively. Therefore, the incorporation of CNC into the conventional GIC may represent a new dental restorative material. Another more recent attempt to improve the mechanical properties and antibacterial properties of GICs was by addition of FG, with the hopes of not impairing their F ion releasing property. White-colored FG was prepared using graphene oxide by a hydrothermal reaction which was then mixed into the GIC powder at four different wt%s (0.5–4 wt%). The authors concluded that adding FG to conventional GICs not only improved mechanical and tribological properties of the hybrid material but also enhanced their antibacterial efficacy. In addition, the FG-GICs did not adversely affect the color, solubility, and F ion release, thereby, paving new roads for applications in restorative dentistry. A comprehensive review of the available literature has revealed that not all modifications in glass powder have resulted in the desirable strengthening of GICs. For instance, metallic oxides and salts such as SrO and BaSO4 did not have a significant effect on the mechanical properties of GICs since they lacked the ability to increase the number of polysalt bridges and cross-linking within the glass matrix. There is a shift of focus toward studies on nanoscale particles and BAG. Research studies have shown that BAGs alone increased the bioactivity but decreased the strength of GICs. However, the addition of Al3+ to the BAG composition resulted in an increase in the compressive strength. Recent research has proven that incorporation of nanoceramics such as HA, FA, SiO2, and ZrO2 have resulted in improved mechanical properties of GICs due to their ability to release fluoride, high surface area, and better particle size distribution. More work should thus, be undertaken to optimize techniques for enhancing the physicomechanical properties of GICs by incorporation of nanophases of ZrO2, HA, and metallic nanofillers. The authors would like to acknowledge the expertise rendered by Prof. Ismail Ab Rahman, toward the preparation of this manuscript. This research was supported by Universiti Sains Malaysia RUI grant No. 1001/PPSG/812164. Crisp S, Ferner AJ, Lewis BG, Wilson AD. Properties of improved glass-ionomer cement formulations. J Dent 1975;3:125-30. Six N, Lasfargues JJ, Goldberg M. In vivo study of the pulp reaction to fuji IX, a glass ionomer cement. J Dent 2000;28:413-22. Nourmohammadi J, Sadrnezhaad SK, Behnamghader A. In vitro bioactivity of novel cured ionomer cement based on iron oxide. Ceram Int 2010;36:1645-51. Pamir T, Sen BH, Celik A. Mechanical and fluoride release properties of titanium tetrafluoride-added glass-ionomer cement. Dent Mater J 2005;24:98-103. Lohbauer U, Walker J, Nikolaenko S, Werner J, Clare A, Petschelt A, et al. Reactive fibre reinforced glass ionomer cements. Biomaterials 2003;24:2901-7. Lohbauer U, Frankenberger R, Clare A, Petschelt A, Greil P. Toughening of dental glass ionomer cements with reactive glass fibres. Biomaterials 2004;25:5217-25. Oliva A, Della Ragione F, Salerno A, Riccio V, Tartaro G, Cozzolino A, et al. Biocompatibility studies on glass ionomer cements by primary cultures of human osteoblasts. Biomaterials 1996;17:1351-6. Moshaverinia A, Ansari S, Moshaverinia M, Roohpour N, Darr JA, Rehman I, et al. Effects of incorporation of hydroxyapatite and fluoroapatite nanobioceramics into conventional glass ionomer cements (GIC). Acta Biomater 2008;4:432-40. Moshaverinia A, Ansari S, Movasaghi Z, Billington RW, Darr JA, Rehman IU, et al. Modification of conventional glass-ionomer cements with N-vinylpyrrolidone containing polyacids, nano-hydroxy and fluoroapatite to improve mechanical properties. Dent Mater 2008;24:1381-90. Yli-Urpo H, Lassila LV, Närhi T, Vallittu PK. Compressive strength and surface characterization of glass ionomer cements modified by particles of bioactive glass. Dent Mater 2005;21:201-9. Hench LL, Xynos ID, Polak JM. Bioactive glasses for in situ tissue regeneration. J Biomater Sci Polym Ed 2004;15:543-62. Yli-Urpo H, Närhi T, Söderling E. Antimicrobial effects of glass ionomer cements containing bioactive glass (S53P4) on oral micro-organisms in vitro. Acta Odontol Scand 2003;61:241-6. De Caluwé T, Vercruysse CW, Declercq HA, Schaubroeck D, Verbeeck RM, Martens LC, et al. Bioactivity and biocompatibility of two fluoride containing bioactive glasses for dental applications. Dent Mater 2016;32:1414-28. De Caluwé T, Vercruysse CW, Ladik I, Convents R, Declercq H, Martens LC, et al. Addition of bioactive glass to glass ionomer cements: Effect on the physico-chemical properties and biocompatibility. Dent Mater 2017;33:e186-e203. Kobayashi M, Kon M, Miyai K, Asaoka K. Strengthening of glass-ionomer cement by compounding short fibres with CaO-P2O5-SiO2-Al2O3 glass. Biomaterials 2000;21:2051-8. Kawano F, Kon M, Kobayashi M, Miyai K. Reinforcement effect of short glass fibers with CaO- P(2)O(5) -SiO(2) -Al(2)O(3) glass on strength of glass-ionomer cement. J Dent 2001;29:377-80. Garoushi S, Vallittu P, Lassila L. Hollow glass fibers in reinforcing glass ionomer cements. Dent Mater 2017;33:e86-93. Lucas M, Arita K, Nishino M. Strengthening a conventional glass ionomer cement using hydroxyapatite. J Dent Res 2001;80:711. Lucas ME, Arita K, Nishino M. Toughness, bonding and fluoride-release properties of hydroxyapatite-added glass ionomer cement. Biomaterials 2003;24:3787-94. Gu YW, Yap AU, Cheang P, Khor KA. Effects of incorporation of HA/ZrO(2) into glass ionomer cement (GIC). Biomaterials 2005;26:713-20. Lee JJ, Lee YK, Choi BJ, Lee JH, Choi HJ, Son HK, et al. Physical properties of resin-reinforced glass ionomer cement modified with micro and nano-hydroxyapatite. J Nanosci Nanotechnol 2010;10:5270-6. Tjandrawinata R, Irie M, Suzuki K. Marginal gap formation and fluoride release of resin-modified glass-ionomer cement: Effect of silanized spherical silica filler addition. Dent Mater J 2004;23:305-13. Hatanaka K, Irie M, Tjandrawinata R, Suzuki K. Effect of spherical silica filler addition on immediate interfacial gap-formation in class V cavity and mechanical properties of resin-modified glass-ionomer cement. Dent Mater J 2006;25:415-22. Ahmad Shiekh R, Ab Rahman I, Malik Masudi SA, Luddin N. Modification of glass ionomer cement by incorporating hydroxyapatite-silica nano-powder composite: Sol–gel synthesis and characterization. Ceram Int 2014;40:3165-70. Rahman IA, Masudi SA, Luddin N, Shiekh RA. One-pot synthesis of hydroxyapatite–silica nanopowder composite for hardness enhancement of glass ionomer cement (GIC). Bull Mater Sci 2014;37:213-9. Moheet IA, Luddin N, Ab Rahman I, Masudi SM, Kannan TP, Abd Ghani NR. Evaluation of mechanical properties and bond strength of nano-hydroxyapatite-silica added glass ionomer cement. Ceram Int 2018;44:9899-906. Elie ED, Maha AG. The zirconia restoration properties: A versatile restorative material. Dentistry 2014;4:219. Rajabzadeh G, Salehi S, Nemati A, Tavakoli R, Solati Hashjin M. Enhancing glass ionomer cement features by using the HA/YSZ nanocomposite: A feed forward neural network modelling. J Mech Behav Biomed Mater 2014;29:317-27. Anusha Thampi VV, Prabhu M, Kavitha K, Manivasakan P, Prabu P, Rajendran V, et al. Hydroxyapatite, alumina/zirconia, and nanobioactive glass cement for tooth-restoring applications. Ceram Int 2014;40 (9 Pt A):14355-65. Rahman IA, Ghazali NA, Bakar WZ, Masudi SM. Modification of glass ionomer cement by incorporating nanozirconia-hydroxyapatite-silica nano-powder composite by the one-pot technique for hardness and aesthetics improvement. Ceram Int 2017;43:13247-53. Xie D, Feng D, Chung ID, Eberhardt AW. A hybrid zinc-calcium-silicate polyalkenoate bone cement. Biomaterials 2003;24:2749-57. Boyd D, Towler MR. The processing, mechanical properties and bioactivity of zinc based glass ionomer cements. J Mater Sci Mater Med 2005;16:843-50. Dickey BT, Kehoe S, Boyd D. Novel adaptations to zinc-silicate glass polyalkenoate cements: The unexpected influences of germanium based glasses on handling characteristics and mechanical properties. J Mech Behav Biomed Mater 2013;23:8-21. Khader BA, Peel SA, Towler MR. An injectable glass polyalkenoate cement engineered for fracture fixation and stabilization. J Funct Biomater 2017;8. pii: E25. Leitune VC, Collares FM, Takimi A, de Lima GB, Petzhold CL, Bergmann CP, et al. Niobium pentoxide as a novel filler for dental adhesive resin. J Dent 2013;41:106-13. Bertolini MJ, Palma-Dibb RG, Zaghete MA, Gimenes R. Evaluation of glass ionomer cements properties obtained from niobium silicate glasses prepared by chemical process. J Non Cryst Solids 2005;351:466-71. Garcia IM, Leitune VC, Balbinot GS, Samuel SM, Collares FM. Influence of niobium pentoxide addition on the properties of glass ionomer cements. Acta Biomater Odontol Scand 2016;2:138-43. Prentice LH, Tyas MJ, Burrow MF. The effect of ytterbium fluoride and barium sulphate nanoparticles on the reactivity and strength of a glass-ionomer cement. Dent Mater 2006;22:746-51. Al Zraikat H, Palamara JE, Messer HH, Burrow MF, Reynolds EC. The incorporation of casein phosphopeptide-amorphous calcium phosphate into a glass ionomer cement. Dent Mater 2011;27:235-43. Zalizniak I, Palamara JE, Wong RH, Cochrane NJ, Burrow MF, Reynolds EC, et al. Ion release and physical properties of CPP-ACP modified GIC in acid solutions. J Dent 2013;41:449-54. Ni S, Chou L, Chang J. Preparation and characterization of forsterite (Mg2SiO4) bioceramics. Ceram Int 2007;33:83-8. Sayyedan FS, Fathi MH, Edris H, Doostmohammadi A, Mortazavi V, Hanifi A. Effect of forsterite nanoparticles on mechanical properties of glass ionomer cements. Ceram Int 2014;40(7 Pt B):10743-8. Sayyedan FS, Fathi M, Edris H, Doostmohammadi A, Mortazavi V, Shirani F, et al. Fluoride release and bioactivity evaluation of glass ionomer: Forsterite nanocomposite. Dent Res J (Isfahan) 2013;10:452-9. Kim DA, Abo-Mosallam HA, Lee HY, Kim GR, Kim HW, Lee HH, et al. Development of a novel aluminum-free glass ionomer cement based on magnesium/strontium-silicate glasses. Mater Sci Eng C Mater Biol Appl 2014;42:665-71. Brauer DS, Karpukhina N, Kedia G, Bhat A, Law RV, Radecka I, et al. Bactericidal strontium-releasing injectable bone cements based on bioactive glasses. J R Soc Interface 2013;10:20120647. 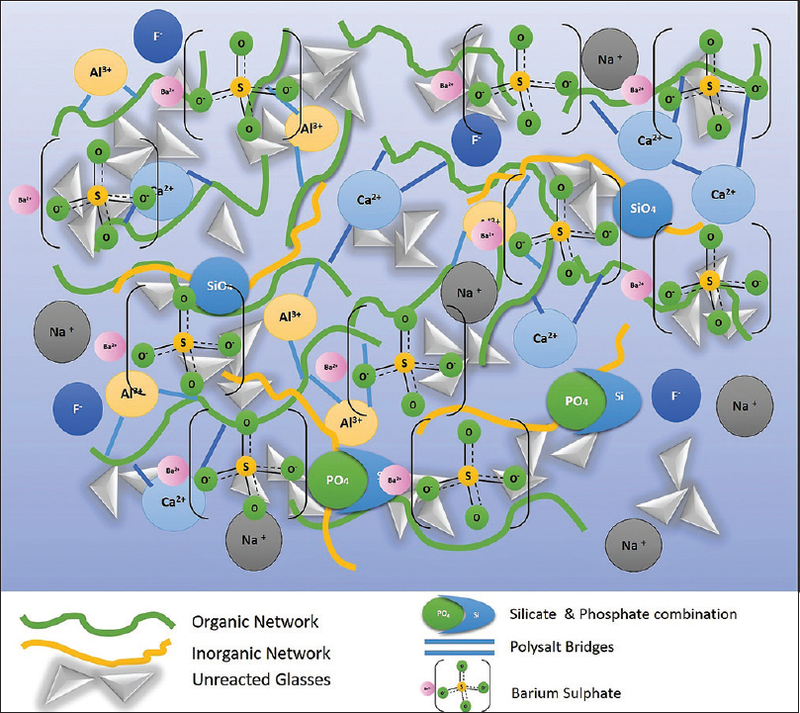 Sinha Ray S, Okamoto M. Polymer/layered silicate nanocomposites: A review from preparation to processing. Prog Polymer Sci 2003;28:1539-641. Dowling AH, Stamboulis A, Fleming GJ. The influence of montmorillonite clay reinforcement on the performance of a glass ionomer restorative. J Dent 2006;34:802-10. Paiva L, Fidalgo TK, da Costa LP, Maia LC, Balan L, Anselme K, et al. Antibacterial properties and compressive strength of new one-step preparation silver nanoparticles in glass ionomer cements (NanoAg-GIC). J Dent 2018;69:102-9. Silva RM, Pereira FV, Mota FA, Watanabe E, Soares SM, Santos MH, et al. Dental glass ionomer cement reinforced by cellulose microfibers and cellulose nanocrystals. Mater Sci Eng C Mater Biol Appl 2016;58:389-95. Sun L, Yan Z, Duan Y, Zhang J, Liu B. Improvement of the mechanical, tribological and antibacterial properties of glass ionomer cements by fluorinated graphene. Dent Mater 2018;34:e115-27.